A magnificent performer, Toto La Momposina is a charismatic living legend of Afro-Colombian song, the original "Queen of Cumbia" whose entire life has been dedicated to representing the music of her country’s Caribbean coastline. A mix of African, indigenous Indian and Spanish cultures gave the region the rich musical traditions which Toto has been instrumental in keeping alive and taking to international audiences. Cumbia is the percussive style characterised by off-beat polyrhythms which exploded across Latin America and beyond; today it is one of the most influential and best-loved musical exports of the region. Toto’s music has touched artists far and wide, from Timbaland (his track ‘Indian Flute’ samples Toto’s Curura) to Manu Chao (who borrowed a chorus from La Verdolaga) to Michel Cleis’ 2009 cumbia-house mega hit La Mezcla (the Ibiza dance track of the summer samples vocals and tambores from El Pescador, No 1 in the Spanish play list for 6 weeks), to Calle13 those who invited her to take part in the song that has turned into the ode of Latin America “Latinoamérica”. Hailing from Talaigua, a tiny village on the banks of the mighty Magdalena River, Toto was born into a family of musicians spanning five generations. The household lived with the musical traditions of ‘la costa’ and she learned to sing and dance as a child. 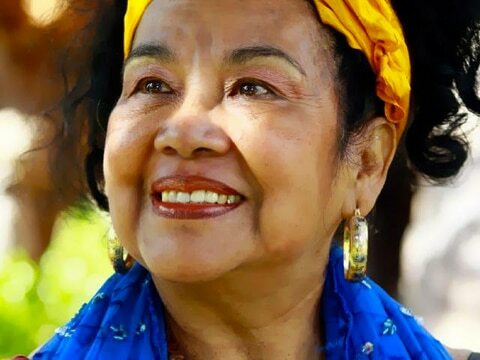 As a teenager, she traveled from village to village researching their various rhythms and dances and studying the art of the cantadora – the gifted women at the heart of rural cultural life. Since the 1960s when Toto emerged as a popular singer, these rhythms have formed the core of a vast repertoire which also embraces other Latin American traditions such as Cuban son, guaracha and bolero. She has toured internationally since the 1970s and in 1982 accompanied Gabriel Garcia Marquez to Stockholm to perform at his Nobel prize ceremony. In the early 1990s her global fame was cemented by a WOMAD tour across three continents and the release of La Candela Viva, the first of many acclaimed albums. In 2006 she was presented with the WOMEX Lifetime Achievement Award for her extraordinary contribution to world music. A dynamic 73 year old, Toto continues to work tirelessly to promote the music of her homeland, driven by passion and the simple joy of performance.